At first glance, trying to figure out the networks in a workplace seems like it might be a fool’s errand, like sculpting smoke. What do you grab? What do you measure? In systems biology, networks are built via large-scale data measurements–transcriptomics, or genome sequencing, or mass spectrometry or other methods. Descriptions of other famous networks, like the US power grid, are also built from large amounts of data. That’s the initial requirement, and I realized that for many organizations there does exist a large scale dataset that could be used, as long as it was used with transparency and care. That dataset is the record of our electronic interactions. These include email. And instant messaging. And meeting requests. And any other form of communication that is tracked by an organization’s servers. Which is to say, all of it. For those companies that supply company issued smartphones, there is additional information about where people go and what they do. All of this data, measured every day, can feed into network construction building algorithms to build a dynamic, real-time measurement of the underlying network structure of an organization. To be clear, I am not talking about text mining. The content of the communications is not important. Metadata like directionality, frequency and timing are. Assessing a work a network in this way wasn’t possible even ten years ago, but advances in telecommunications, uptake of online tools, and our ability to monitor and handle these kinds of data have all combined to make network-building doable. It goes without saying that this is sensitive information, and the recent public disclosure of the NSA surveillance program has made this topic an extremely touchy one. Maybe that makes this concept a non-starter, but I still think it could be done as long as transparency and care are made the top priorities during execution. I think ideally the network creation and monitoring would be done by a third party with impeccable integrity, and with full transparency in terms of what they are reporting back to the organization. So how could knowledge of the network itself provide insight into the health of an organization? Once a network is built it can be assessed and measured on a variety of levels. Overall, what kind of network is it? In their seminal paper on ‘small-world’ network theory, Watts and Strogatz described a form of network somewhere between completely ordered and completely random. Among other things, ‘small-world’ networks optimize the movement of information and computational power. Depending upon the perceived needs of the organization, a ‘small-world’ network might be the optimal configuration. Starting with the assumption that a ‘small-world’ network is the desired state, what does management do next? First, they assess the current network architecture. Does it appear too structured, unidirectional and rigid, possibly implying too much hierarchy and imposed order? Conversely, is it largely chaotic, suggesting insufficient organization? Next, management watches. This is important because as students of complex systems have learned, nothing ever remains the same. Taking a single snapshot is like taking someone’s temperature at 3pm on Tuesday, April 5th and assuming that’s constant over the life of the patient. Over time the general pattern of the network will become clear. From there, a number of uses suggest themselves. 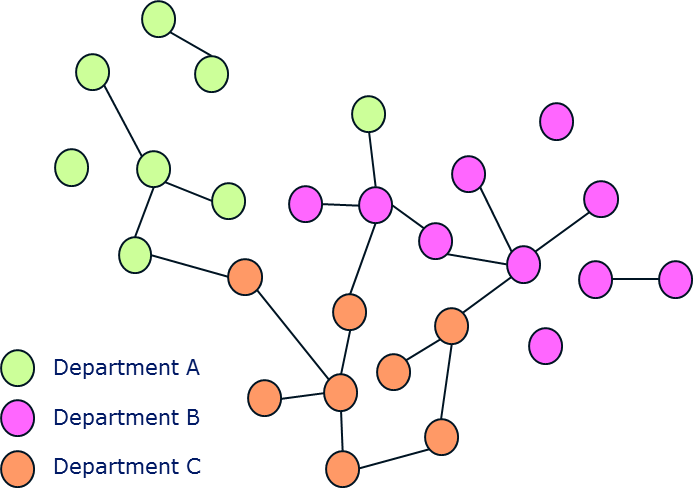 Different pieces of data can be overlaid on the network to to see if structure in the network corresponds to specific things like department or role or age. This could provide a measure of whether the organization is functioning as expected. 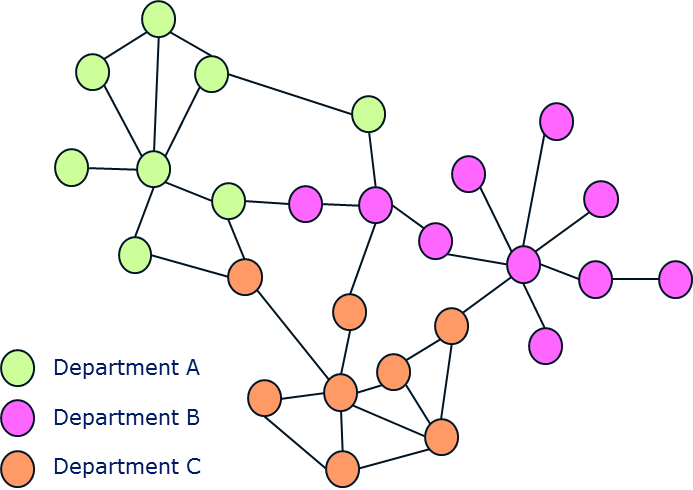 For example, if the organization values low barriers between departments and collaboration, the following picture of the network might suggest a need to do more to promote cross-department interactions. Conversely, if that same network looked like this several months later, that might indicate problems with general interactivity (assuming that’s a priority) as the number of links between groups and individuals is on the decline. The structure of the network also highlights those individuals who are highly interactive, both within and between groups. Since efficient information dissemination is often a need for an organization, these well connected individuals might be asked to help with spreading information, to make the process most efficient. Indeed, connectivity itself might become one of the traits by which an employee is evaluated, in addition to other performance characteristics. A recent study in Science about how information about microfinance loans travels through Indian villages provides an example of how network structure is tied to getting the word out. It turns out the spread of learning about microfinance loans throughout the village can be predicted based on how centrally located the initial people were who first heard about microfinance loans. Another use would be to simply check in. When bad or good news is reported about the organization, does network robustness suffer or does it go into overdrive? We’re not talking about specific details here, just patterns of information flow. When new employees are hired or employees leave or are let go, what happens then? Is the network growing in connections over time, leading to overall greater redundancy or robustness, or is it gradually withering, like galaxies drifting away from each other in space? The point of this thought exercise is that organizations need ways to measure their overall health and get feedback as quickly as possible. I don’t know if network analysis would be better than more traditional methods, but it would be different and I think it would be worth trying, especially as the tools are now available to do so. By watching the network, much like watching biomarkers in experiments or baseball statistics as the season progresses, an organization can understand more about itself and identify possible problems and opportunities, maybe before the collective members know it themselves. This entry was posted in Big Data, Biotech/Pharma, Business, Disruptive technologies, Genomics, Knowns and Unknowns, Metrics, Randomness and tagged data analysis, interactions, microfinance, monitoring, network theory, networks, organizational structure, workplace communication, workplace health. Bookmark the permalink.